No American statesman has been as revered and as reviled as Henry Kissinger. Hailed by some as the "indispensable man", whose advice has been sought by every president from John F Kennedy to George W Bush, Kissinger has also attracted immense hostility from critics who have cast him as an amoral Machiavellian - the ultimate cold-blooded "realist". 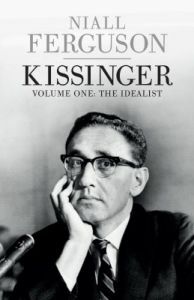 In this remarkable new book, the first of two volumes, Niall Ferguson has created an extraordinary panorama of Kissinger's world, and a paradigm-shifting reappraisal of the man. Only through knowledge of Kissinger's early life (as a Jew in Hitler's Germany, a poor immigrant in New York, a GI at the Battle of the Bulge, an interrogator of Nazis, and a student of history at Harvard) can we understand his debt to the philosophy of idealism. And only by tracing his rise, fall and revival as an adviser to Kennedy, Nelson Rockefeller and, finally, Richard Nixon can we appreciate the magnitude of his contribution to the theory of diplomacy, grand strategy and nuclear deterrence.